A trigonometric ratio is a ratio between two sides of a right triangle. The sine ratio is just one of these ratios. 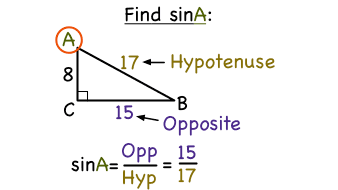 In this tutorial, you'll see how to find the sine of a particular angle in a right triangle. Take a look! A trigonometric ratio is a ratio between two sides of a right triangle. The cosine ratio is just one of these ratios. In this tutorial, you'll see how to find the cosine of a particular angle in a right triangle. Take a look! A trigonometric ratio is a ratio between two sides of a right triangle. The tangent ratio is just one of these ratios. In this tutorial, you'll see how to find the tangent of a particular angle in a right triangle. Take a look!